Objective : Medication errors are the most common medical errors, which may result in some complications for patients. This study was carried out to investigate what influence medication errors by nurses from their viewpoint. Methods: In this descriptive study, 150 nurses who were working in Qazvin Medical University teaching hospitals were selected by proportional random sampling, and data were collected by means of a researcher-made questionnaire including demographic attributes (age, gender, working experience,…), and contributing factors in medication errors (in three categories including nurse-related, management-related, and environment-related factors). Findings : The mean age of the participant nurses was 30.7 ± 6.5 years. Most of them (87.1%) were female with a Bachelor of Sciences degree (86.7%) in nursing. The mean of their overtime working was 64.8 ± 38 h/month. The results showed that the nurse-related factors are the most effective factors (55.44 ± 9.14) while the factors related to the management system (52.84 ± 11.24) and the ward environment (44.0 ± 10.89) are respectively less effective. The difference between these three groups was significant ( P = 0.000). In each aforementioned category, the most effective factor on medication error (ranked from the most effective to the least effective) were as follow: The nurse's inadequate attention (98.7%), the errors occurring in the transfer of medication orders from the patient's file to kardex (96.6%) and the ward's heavy workload (86.7%). Conclusion : In this study nurse-related factors were the most effective factors on medication errors, but nurses are one of the members of health-care providing team, so their performance must be considered in the context of the health-care system like work force condition, rules and regulations, drug manufacturing that might impact nurses performance, so it could not be possible to prevent medication errors without paying attention to our health-care system in a holistic approach. Medication error is one of the most common medical errors. Moreover, the medication error means a disorder in the treatment process, which is followed by a potential or actual risk of hazard for patient. Nowadays, medication errors have attracted more attention because of the complications like higher mortality rate and cost of health-care. In the USA, the medication error-related deaths have been more than the deaths related to the car accidents, breast cancer and human immunodeficiency virus/acquired immune deficiency syndrome. The first reports related to medication errors have been published since 1940 that attracted the authors' attention for preventing them. A recent report by the Institute of Medicine estimated that the medication errors cause between 44,000-98,000 deaths each year in USA hospitals and it costs between $6-29 billion to compensate for the adverse effects of such errors. In general, the errors can be happened in different steps of the medication process, but a considerable number of errors occur during medication administration that registered nurses play a vital role in it because of their responsibility for administering drugs in the hospitals. Nurse-related medical errors like other medical staffs' errors may cause reversible and irreversible complications which result in higher cost and even increasing mortality. Studies show that some factors such as medication miscalculations, lack of knowledge and proficiency as well as neglecting the hospital's medication protocol due to lack of time, extreme tiredness, inadequate work experience and inappropriate work environment may all be related to the medication errors made by the nurses. Hend and Barber (2000) classified the causes for medication errors into three categories of personal, contextual and knowledge-based factors, personal factors include, stress, tiredness, confusion, the physician prescription, errors of orders implementation, inadequate attention to details, lack of job-satisfaction, unpleasant workplace, decreased sense of commitment and career conscience and so on. Some examples of contextual factors are the lack of competent and skilled staffs, heavy overtime work, long work days, a crowded ward, necessity of intensive cares, and etc., and some of the knowledge-based causes include, inadequate pharmaceutical knowledge and experience, no awareness about patients' and drug mathematical calculations. Although, a severe shortage in the nursing workforce in Iran's hospitals may increase the probability of medication errors occurrence, it can be undoubtedly said that it isn't the only reason for the medication errors. It should be therefore, investigated to find out which factors may lead to the medication errors in hospitals. Since, the medication errors made by a health-care team including physicians and nurses may affect the outcome and quality of health-care, in addition to the fact that the nursing personnel are more involved in medication administration activities than other health-care workers, identifying the factors contributing to medication errors occurrence from the viewpoint of nurses will help reduce the medication errors to a minimum and enhance the quality of nursing services. Accordingly, this study was conducted to determine contributing factors of medication errors from viewpoint of nurses in affiliated teaching hospitals in Qazvin university of medical sciences. In this descriptive cross-sectional study, 150 registered nurses who work in different wards of four teaching hospitals of Qazvin University of Medical Sciences in 2010 were selected through proportional random sampling and completed a researcher-made questionnaire. The questionnaire was made by using the different resources related to the medication subject and aforementioned common errors. ,, The questionnaire was sent to 10 faculties of Qazvin nursing and midwifery school of Qazvin University of Medical Sciences for ensuring its face and content validity, all 10 faculties replied, then necessary corrections were made according to their comments; revised questionnaire was sent to two of these faculties for final confirmation that they both verified it. The questionnaire was assessed using the Cronbach's alpha (r0 = 0.86) to measure internal consistency (the higher cronbach's alpha, the more consistency between inter-items of the questionnaire). The first part of the questionnaire asked for demographic information such as age, gender, income, working experience, educational level, and working ward. The second part asked for the nurses' viewpoint about what influence on medication errors in three categories including, the nurse-related factors (10 items including: Inadequate attention, tiredness due to excessive overtime work, inadequate pharmacologic knowledge, no minute for assessment before drug administration, shortage of time, inadequate experience, nurses' affective and mood problems, personal, and familial problems, no interest for job, financial/economical problems), the ward environment-related factors (15 items including: Heavy workload in the ward, lack of required equipment, Similar drug name and label, similar drug packing, drug arrangements on shelves, ward's medication protocol, noisy ward environment, arrangement of devices, and equipment's in the treatment room, variety of drugs used by the patient, the ward type (Surgery, Emergency, Pediatric,…), overcrowding of the treatment room, inadequate lighting of the treatment room, drug administration route, instability of patient's physiological condition, small treatment room), and the management-related factors (11 items including: Incorrect transfer of medication orders from the patient's file to kardex, incorrect transfer of medication orders from kardex to medicine card, illegibility of physician's order in patient's file, illegibility of drug card, illegibility of kardex, low nurse/patient ratio, inadequate staffs in each working shift, leadership style in the ward, working in night shift, working in evening shift, working in the morning shift). Nurses were asked to answer in a likert scale rating: "Ineffective," "moderately effective," "effective," and "highly effective." In order to facilitate the possibility of comparing these three categories, each section was scored out of 100 points. Ineffective answers were considered as zero score, and by increasing the effect the scores 1, 2, 3 were considered respectively; then the total score changed to 100 for comparing them with each other. The researchers attended in the above mentioned teaching hospitals during different work shifts and after obtaining the nurses' consent, they distributed the questionnaire and collected them after 24 h. The SPSS (v. 13) software was used for data analysis through ANOVA for comparing the means of effect score of the items in three group's factors, and also Freidman tests for one-way repeated measures analysis of variance between ranks of three different groups of factors. Significance level of statistical differences was considered at 0.05. The mean age of the nurses was 30.7 ± 6.5 years. Most of them (87.1%) were female with a Bachelor of Sciences degree (86.7%) in nursing. Their average monthly overtime work was 64.8 ± 38 h. The results totally showed that the nurse-related factors with the mean score of 55.44 ± 9.14 are the most effective factors in medication errors occurrence and the factors related to the management and the ward environment with mean scores of 52.84 ± 11.24 and 44.0 ± 10.89, respectively were less effective. This difference was statistically significant (P = 0.000) [Table 1]. [Table 2] shows the frequency of the above-mentioned factors from the most effective to the least effective (considering the total amount of two columns of "highly effective" and "effective" for ranking). 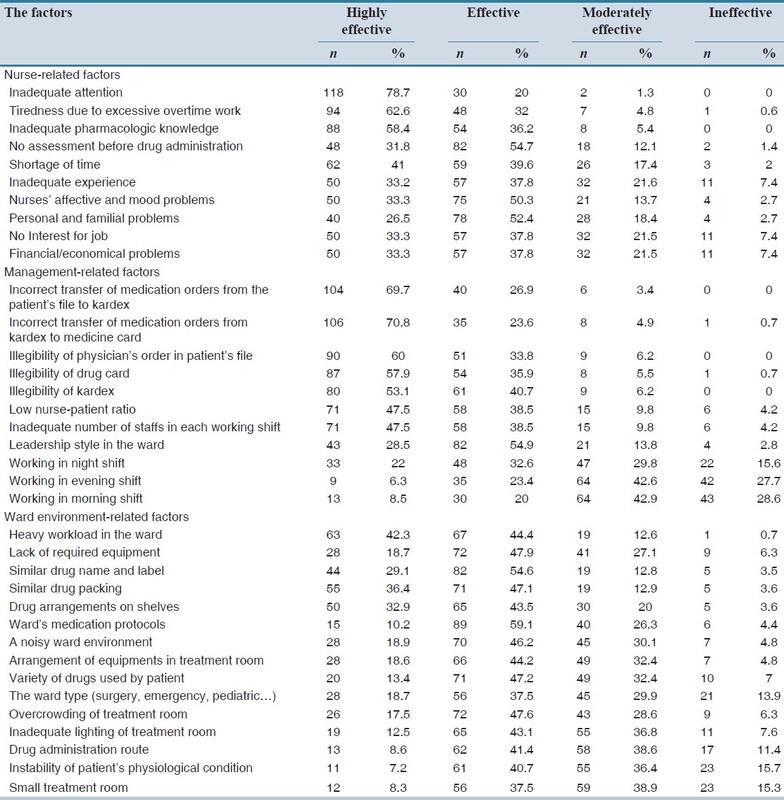 In the personal factors category, from the nurses' point of view, factors such as nurse's carelessness, tiredness caused by excessive overtime work, inadequate knowledge in pharmacology and insufficient experience are the most effective factors; and factors such as financial problems and lack of interest in nursing job are the least effective factors [Table 2]. Among management-related factors, the most effective factors are the transfer incorrect of medication orders from the patients' file into their kardex, and from kardex into the medicine card, the illegibility of physician's order in patient's file, the illegibility of patient's medicine card and kardex. The least effective factor in this category is working in different shifts [Table 2]. The most effective environment-related factor is ward's heavy workload; the size of the treatment room and the instability of patient's condition are the least effective factors [Table 2]. There was seen no significant difference between the demography of nurses (age, gender, working experience…) and the contributing factors of medication errors ( P > 0.05). In this research, the top contributing factor among nurse-related factors was careless performance of the nurses which is mentioned as one of the most effective factor by other researches too. ,,,, Tiredness is the second most effective factor in medication errors from the viewpoint of nurses participating in this research and many other researchers have also referred to tiredness as an effective factor. ,,, Inadequate knowledge in pharmacology (administration routes, drug incompatibilities, drug side-effects and the way of preventing them and even some dosage calculations) is another very important factor involved in medication errors occurrence, according to the present research as well as some other researches. , In some other studies, the insufficient pharmacological knowledge is referred to as one of the three most important reasons in occurrence of medication errors. , Although, all nursing students should pass pharmacology course at university, some periodic continuing education programs are needed for nurses to improve their pharmacological knowledge particularly because of continuous supply of new drugs to the drug market and the necessity of learning the new indications of old drugs. In this study, nurses believed that the nurse-related factors are the most effective factors in occurrence medication errors. Of course, there were some limitation for this study such as limited data collection environment (only in teaching governmental hospitals and not in private hospitals), and small sample size; but we cannot ignore the fact that occurrence of medication errors is a multi-factorial phenomenon, which must be seen from organizational, and managerial aspects, particularly, it is necessary to pay attention to human resources, which might be the most important factor. Yon kyong and Barbara believe that human errors are impossible to be completely prevented. However, it is obviously practical that improve the quality of health-care services through proper managerial and organizational preparations by means of moderating the work hours and overtime work, eliminating the tasks and activities irrelevant to a nursing career, increasing the job motivations, improving nurses' professional knowledge, and enhancing the work environment standards. We would like to appreciate participating nurses for their cooperation. Additionally, we would like to give our regard to Tahere Sadeghi for her contribution in statistical analysis and interpretation. We also thank deputy of research in Qazvin nursing faculty because of financial support of the study . Akram Shahrokhi has contributed in study design, statistical analysis and manuscript editing. Fatemeh Ebrahimpour has contributed in study design, data collection and manuscript preparation. Arash Ghodousi has done statistical analysis of the data and manuscript editing. 1. Goeckner B, Gladu M, Bradley J, Garmon SC, Hicks RW. Differences in perioperative medication errors with regard to organization characteristics. AORN J 2006;83:351-2, 355-62, 365-8. 2. Britten N. Medication errors: The role of the patient. Br J Clin Pharmacol 2009;67:646-50. 3. Kelishadi R, Mousavinasab F. Rational use of medicine in the pediatric age group: A summary on the role of clinical pharmacists. J Res Pharm Pract 2012;1:10-13. 4. Fry MM, Dacey C. Factors contributing to incidents in medicine administration. Part 1. Br J Nurs 2007;16:556-8. 5. Johnson JA, Bootman JL. Drug-related morbidity and mortality. A cost-of-illness model. Arch Intern Med 1995;155:1949-56. 6. Throckmorton T, Etchegaray J. Factors affecting incident reporting by registered nurses: The relationship of perceptions of the environment for reporting errors, knowledge of the nursing practice act, and demographics on intent to report errors. J Perianesth Nurs 2007;22:400-12. 7. Clifton-Koeppel R. What nurses can do right now to reduce medication errors in the neonatal intensive care unit. Newborn Infant Nurs Rev 2008;8:72-82. 8. Hashemi F, Nasrabadi AN, Asghari F. Factors associated with reporting nursing errors in Iran: A qualitative study. BMC Nurs 2012;11:20. Available from: http://www.biomedcentral.com/1472-6955/12/20. [Last accessed on 2012 Nov 10]. 9. Carlton G, Blegen MA. Medication-related errors: A literature review of incidence and antecedents. Annu Rev Nurs Res 2006;24:19-38. 10. Tang FI, Sheu SJ, Yu S, Wei IL, Chen CH. Nurses relate the contributing factors involved in medication errors. J Clin Nurs 2007;16:447-57. 11. Fry MM, Dacey C. Factors contributing to incidents in medicine administration. Part 2. Br J Nurs 2007;16:676-81. 12. Mrayyan MT, Shishani K, Al-Faouri I. Rate, causes and reporting of medication errors in Jordan: Nurses′ perspectives. J Nurs Manag 2007;15:659-70. 13. Mark BA, Belyea M. Nurse staffing and medication errors: Cross-sectional or longitudinal relationships? Res Nurs Health 2009;32:18-30. 14. Eslamian J, Taheri F, Bahrami M, Mojdeh S. Assessing the nursing error rate and related factors from the view of nursing staff. Iran J Nurs Midwifery Res 2010;15:272-7. 15. Harding L, Petrick T. Nursing student medication errors: A retrospective review. J Nurs Educ 2008;47:43-7. 16. Garrett C. The effect of nurse staffing patterns on medical errors and nurse burnout. AORN J 2008;87:1191-204. 17. Olds DM, Clarke SP. The effect of work hours on adverse events and errors in health care. J Safety Res 2010;41:153-62. 18. Schelbred AB, Nord R. Nurses′ experiences of drug administration errors. J Adv Nurs 2007;60:317-24. 19. Hassan H, Das S, Se H, Damika K, Letchimi S, Mat S, et al. A study on nurses′ perception on the medication error at one of the hospitals in East Malaysia. Clin Ter 2009;160:477-9. 20. Wright K. Student nurses need more than maths to improve their drug calculating skills. Nurse Educ Today 2007;27:278-85. 21. Kopp BJ, Erstad BL, Allen ME, Theodorou AA, Priestley G. Medication errors and adverse drug events in an intensive care unit: Direct observation approach for detection. Crit Care Med 2006;34:415-25. 22. Grandell-Niemi H, Hupli M, Puukka P, Leino-Kilpi H. Finnish nurses′ and nursing students′ mathematical skills. Nurse Educ Today 2006;26:151-61. 23. Pelliciotti Jda S, Kimura M. Medications errors and health-related quality of life of nursing professionals in intensive care units. Rev Lat Am Enfermagem 2010;18:1062-9. 24. Font Noguera I, Climent C, Poveda Andrés JL. Quality of drug treatment process through medication errors in a tertiary hospital. Farm Hosp 2008;32:274-9. 25. Lee BH, Lehmann CU, Jackson EV, Kost-Byerly S, Rothman S, Kozlowski L, et al. Assessing controlled substance prescribing errors in a pediatric teaching hospital: An analysis of the safety of analgesic prescription practice in the transition from the hospital to home. J Pain 2009;10:160-6. 26. Warholak TL, Queiruga C, Roush R, Phan H. Medication error identification rates by pharmacy, medical, and nursing students. Am J Pharm Educ 2011;75:24. 27. Pham JC, Story JL, Hicks RW, Shore AD, Morlock LL, Cheung DS, et al. National study on the frequency, types, causes, and consequences of voluntarily reported emergency department medication errors. J Emerg Med 2011;40:485-92. 28. Mahmood A, Chaudhury H, Valente M. Nurses′ perceptions of how physical environment affects medication errors in acute care settings. Appl Nurs Res 2011;24:229-37. 29. Alvarez G, Coiera E. Interdisciplinary communication: An uncharted source of medical error? J Crit Care 2006;21:236-42. 30. Kyung CY, Barbara M. Moderating effects of learning climate on the impact of RN staffing on medication errors. Nurs Res 2011;60:32-9.